Atomy is advancing into the world’s largest country, Russia, which spans widely across Europe and Asia. After its recent opening in Australia, Atomy has lost no time in working towards the official opening of Atomy Russia scheduled to launch in early December of this year. Russia is the largest country in the world by area, covering more than 17 million square kilometers. That’s 170 times the size of South Korea which is only about 100,000 square kilometers. Russia’s population is over 144 million (2018 estimate), and its per capita income is $12,000 (2018 IMF). Although its population is relatively small with respect to the size of the country, 15% of the population is concentrated in Moscow and other metropolitan areas. Thus, manufacturing and distribution of consumer goods and food products are well developed in this area. In addition, the Russian market is closely linked to the CIS (Commonwealth of Independent States) market, which will assist Atomy in opening its doors to other countries such as Uzbekistan, Kazakhstan, Turkmenistan, and Moldova in the future. Since the transition from the Soviet Union to Russia, 43% of consumer goods have been imported from abroad. The import market has expanded rapidly with an increase in consumer purchasing power, especially due to a boom in the economy boosted by a high export of energy resources since the early 2000s. The middle class, making up about 25% of the total population, is steadily becoming the major consumer group. It is worthwhile to note that the middle class in Russia has a fairly high disposable income because of the country’s low public utility bills and high housing penetration rate. According to a report by Credit Swiss, a middle manager with an annual income of $24,000 is estimated to have about $10,000 of real disposable income in Moscow. This is very high compared to the $7,000 of disposable income of people in the U.S. with an annual income of $60,000. Likewise, Rosgosstrakh, an insurance company in Russia, assessed that these middle-class consumers tend to purchase goods and services for life’s conveniences without restriction. The cosmetics market in Russia is expected to become a booming field with continuous market growth for the time being due to economic recovery. In particular, the market for Korean cosmetics has been expanding with increasing popularity recently. This is because the cost-effective Korean cosmetics are said to be replacing luxury European cosmetic brands since the economic recession in 2015. Another reason for this increased demand in Korean cosmetics could be attributed to the rise of e-commerce and the development of online distributors who import and sell various goods on a smaller scale. The wellness market is also showing a very rapid growth rate. According to KOTRA, Russia's health food market was worth 63.1 billion RUB (about $15.8 billion) in 2013, but it was projected to grow by 11.5% to 70.9 billion RUB ($17.6 billion) in 2018. With interest in diet and health foods spreading through Russian mass media, social media, blogs, etc., the health food market is expected to continue expanding. In addition, so-called 'healthy snacks' such as organic products and fitness low-carb products that were only sold by some online shops and specialty stores are now widely available in large supermarkets, and their sales continue to increase. 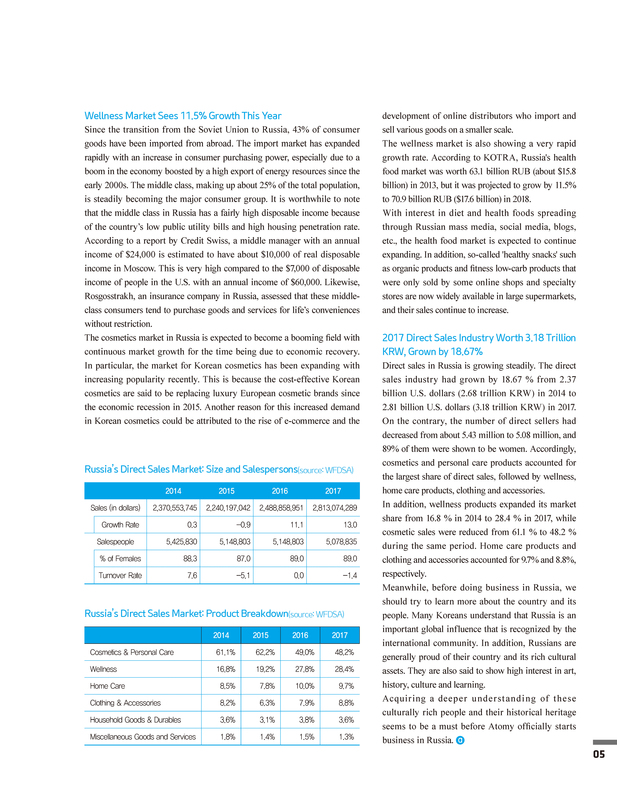 Direct sales in Russia is growing steadily. The direct sales industry had grown by 18.67 % from 2.37 billion U.S. dollars (2.68 trillion KRW) in 2014 to 2.81 billion U.S. dollars (3.18 trillion KRW) in 2017. On the contrary, the number of direct sellers had decreased from about 5.43 million to 5.08 million, and 89% of them were shown to be women. Accordingly, cosmetics and personal care products accounted for the largest share of direct sales, followed by wellness, home care products, clothing and accessories. In addition, wellness products expanded its market share from 16.8 % in 2014 to 28.4 % in 2017, while cosmetic sales were reduced from 61.1 % to 48.2 % during the same period. Home care products and clothing and accessories accounted for 9.7% and 8.8%, respectively. Meanwhile, before doing business in Russia, we should try to learn more about the country and its people. Many Koreans understand that Russia is an important global influence that is recognized by the international community. In addition, Russians are generally proud of their country and its rich cultural assets. They are also said to show high interest in art, history, culture and learning. Acquiring a deeper understanding of these culturally rich people and their historical heritage seems to be a must before Atomy officially starts business in Russia.